HOUSING EXPERTS HAVE said that rent control laws are not working after rents nationwide rose by almost 12% in the year to March. The latest Daft quarterly rental report found that the average monthly rent for properties listed on its website was €1,261. This marks a monthly increase of €232 compared to a previous peak a decade ago in 2008. The latest report marks the eighth consecutive quarter in which annual inflation in rents has surpassed 10% as well as the eighth consecutive quarter that a new record has been set. Rents are still by far at their highest in Dublin, with the average rents in the capital at €1,875 in March – a 12.4% raise year-on-year. The consistent rises in rents, and dwindling supply of rental stock, has prompted experts to question whether current rent control laws are working. “If there are too many people chasing too few goods the rent goes up. And that’s what’s happening at the moment,” economist Ronan Lyons told RTÉ’s Morning Ireland yesterday. “And it seems the Rent Pressure Zones are not working and are probably not working for the reason related to that. Rent Pressure Zone laws were first introduced in December 2016 by then-Housing Minister Simon Coveney to tackle spiralling rents. The criteria for an area to become a Rent Pressure Zone was monitored by the Residential Tenancies Board (RTB). Basically, an area had to have annual rent increases of over 7% or more in four of the previous six quarters and the rent levels had to already be above the national average. All of Dublin and Cork city were the first places to be designated as RPZs, with many other areas following over the past 18 months. Today, 21 local electoral areas in Ireland are designated as RPZs, with others due to follow as rents continue to rise. The introduction of RPZs was met with a mixed response – with some groups saying that the 4% limit didn’t go far enough in protecting tenants. Meanwhile, landlord advocates have insisted that rent controls were harmful in the long run – by causing property owners to leave the market. “When will justice be afforded to the providers of rented accommodation?” said Irish Property Owners Association chairman Stephen Faughnan on the release of the latest figures. “Property owners are leaving the sector in their droves. 40,000 have already made their exit – more to follow. It does not appear to matter to politicians. However, from the point of view of tenant advocacy charities, one criticism levelled at the rent control laws is that there are too many loopholes in them that landlords are able to exploit. Housing charity Threshold has said repeatedly that landlords are flouting the laws and raising rents far more than the 4% allowed limit. “It isn’t legal for a landlord to evict a tenant and then look for a very substantial rise afterwards,” Threshold CEO John-Mark McCafferty told TheJournal.ie last year. “We’re hearing that people who want to rent and go to rent either don’t know for sure whether the rent is correct and they can’t challenge it until after the fact. And there will always be someone at the viewing who is able to pay a higher level because of how few properties are available. Under the current laws, a landlord can evict a tenant and raise the rent above the limits if substantial refurbishment is carried out on the property. There have been multiple warnings and anecdotal reports that landlords are using this clause to evict tenants, carry out minor refurbishments and then charging new tenants significantly higher rents. The flouting of rental laws by landlords, as well as the fact that the market is weighted heavily for demand rather than supply, has led housing advocates and opposition politicians to state that Rent Pressure Zone legislation is not working as it should be in tackling rising rents. 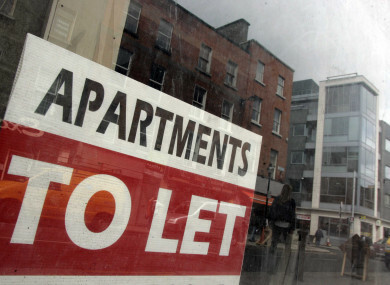 Housing experts, economists, charity officials and the government itself have all said that the main thing needed to combat Ireland’s rising rents is an increased supply of properties in the private rental sector. The Housing Department has insisted it is significantly ramping up housing construction, but that it will take time before the results begin to be felt in the market. Until then, a number of measures have been identified that could help the situation in the interim. Threshold has said that a publicly searchable index of the rents charged by landlords on a property-by-property basis would help to ensure that landlords can’t raise rents significantly when taking in new tenants. This was also put forward as a possible solution by Ronan Lyons. “The RTB do have… the individual rents for particular properties but they don’t publish them,” he said. That would at least give tenants some more market power. An RTB spokesperson said that it could not publish rental data at an individual address level in order to “protect people’s personal data”. “The Cabinet has approved Heads of Bill which will bring forward legislation in relation to a number of matters which will help compliancy with the RPZs,” the spokesperson said. “This includes a proposal to allow the RTB to publish more detailed rental information. The RTB will also be empowered to investigate potential breach or contraventions of RPZ rules. Tenants who are concerned that their rent has not been set in accordance with RPZ legislation are encouraged to contact the RTB and to refer a dispute to us in these cases. Housing Minister Eoghan Murphy last month announced a raft of proposed new measures that would form part of the new Residential Tenancies Bill. Among these is a planned law making it a criminal offence for landlords with properties in RPZs to raise the rent above the legally allowed 4%. “What we’re bringing now is a sanctions regime making it a criminal offence, that we’ll follow with a number of measures that will be allowed to be implemented by the RTB (Residential Tenancies Board) including fines,” Murphy told reporters at the time. He said at the moment the fine being considered would be in the region of €15,000. The Housing Department said in a statement that RTB’s Rent Index report is expected in June and that it provides more accurate data than the Daft report. Email “'Rent Pressure Zones are not working': What can be done to stop rising rents?”. Feedback on “'Rent Pressure Zones are not working': What can be done to stop rising rents?”.